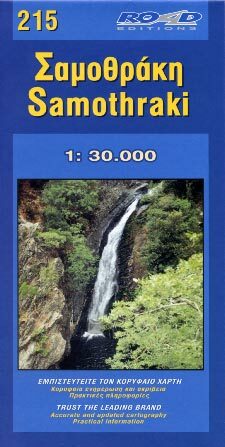 This map of Samothraki island incorporates in its backside a mini travel guide in full color, with many images and all the nessesary information on the touristic sights and the individual character of this island. It also includes a complete list of the hotels and rooms to let in the island, many usefull telephone numbers, and a note on the island's history. The map of Samothraki presents the complete road network of the island, against a geophysical background of high accuracy (Map Datum ED50) with contour intervals of 20 meters. In cooperation with the local mountaineering club, all major footpaths are clearly marked on the map. With clear symbols, bright colors and easy to read lettersets, you can see all the touristic sights of the island, castles, archaeological sites, beaches, country churches, fountains, gorges, and many more.